Wearable technology is part of a megatrend involving integration of electronics into every aspect of our surroundings. Our most immediate surroundings - our clothing, watches and even our bodies themselves - are a key part of this. Features such as sensors, actuators, processors, interfaces and all that is needed to support and power them are being integrated onto and into the body with unprecedented reach and volumes. But the use of sensors to quantify the physical features on the body is nothing new. The medical profession has been monitoring features such as heart rate, blood pressure, temperature and others for more than a century. Medical instruments with sensors were to enable medical-grade accuracy, used by trained physicians on reluctant patients. Early instruments may have been the stuff of horror films, but modern medicine has now brought increasingly invisible, practical and comfortable devices, made with patient comfort in mind, yet maintaining uncompromisable accuracy. The dawn of consumer wearable technology opens up new possibilities for sensor developers. Consumers are placing advanced electronic objects on, close-to and even inside, the body for the first time in large volumes. Therefore, the challenge is to fill these objects with useful things to make valuable products. BLE has improved low power communication ability, investment pours into improving power solutions and processors, but what about the sensors? The chart above shows the IDTechEx growth forecast for various wearable sensor types, showing average CAGR from 2015-2025. 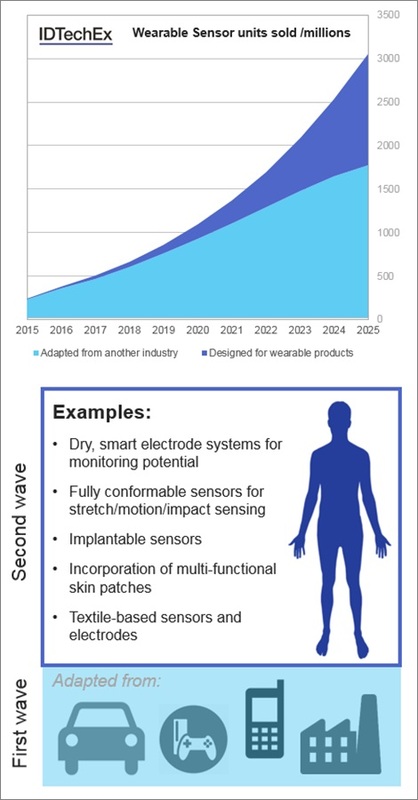 For more information about this forecast, including detailed unit and revenue forecasts by sensor type and application area, see the IDTechEx report Wearable Sensors 2015-2025: Market Forecasts, Technologies, Players. When it comes to the revenue growth rates for various sensor types, product iteration timelines are a key feature. The medical space typically follows 5-10 year product iterations. In contrast, consumer electronics iterations can take less than 6 months. The industries merge in the wearable sensor space, with each bringing its own challenges. Sensors from the consumer electronics space are commoditised quickly; for example, the margin made on typical MEMS IMUs for consumer electronics has dropped to less than 20%, from nearly 50% five years ago. In contrast, the regulatory restriction on medical sensors keeps margins well above 100%. Regulation, product subsidies and strong IP protection all help this. But what does this mean for the industry? The IDTechEx report characterises sensors into categories by specific type and general type, as well as other charts showing the state of the industry and 10 year market forecasts. One example output figure is shown below. In 2015, more than 98% of the wearable sensors sold were originally developed for another industry, and then minimally adapted to a wearable product. The best examples of these are IMUs and optical sensors; two of the largest sectors, and both based on commodity hardware adapted from the automotive/consumer electronics industry. The next decade shows a significant change in this pattern. Made-for-wearable sensors are beginning to reach the market, and will contribute significantly to the units sold and revenue growth over the next decade. In 2025, more than 30% of the sales volume will come from emerging sensor types. 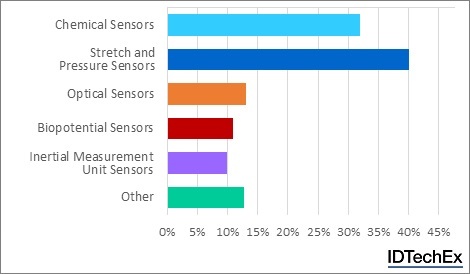 The emerging sensors, with examples as given in the figure, are where most of the hardware interest and investment now lies. For the old sensors, the value comes from developing software, data analysis algorithms and user interfaces to maximise their efficiency. Details of how these value chains are setup is provided in the IDTechEx report, and case studies are used to illustrate some of the key trends in the last year.